The petrocollapse and the economic crisis have a bright side; they will be the catalyst for the rebirth of the local small farm. These will be the kinds of farms that we need: diverse, educational, and organic. The new generation of small farms will be more diverse than the previous generation. During the era of cheap fuel and other inputs, large-scale farms were profitable. However, input prices are rising and commodity or crop prices are falling. Corn and soybean prices per bushel have fallen 30 to 40 percent in the last year respectively. Milk prices have plummeted 35 percent in the last two months. Right now the price of milk barely covers the cost of feed alone. Diversity in niches not competing with big agribusiness is the key to success. Here are a couple examples of this new model. The Seven Seeds Farm in Williams, OR grows certified organic vegetables, fruits, berries, seeds, sheep for wool and lamb and poultry, offers Community Supported Agriculture (CSA) shares, and the owner, Don Tipping is one of the leading educators in the region. Mark Shepard at Forest Agriculture Enterprises grows hazelnuts and chestnuts using permaculture techniques in Viola, WI; he even sells the trees. Note the diversity and niche items such as organically grown nuts and seeds. Remember too that they have a much longer shelf life than produce. The Central Rocky Mountain Permaculture Institute located at 7,200 feet above sea level in Basalt, CO offers a variety of permaculture design courses, edible landscape design consulting and nursery stock, plus organic herbs to local grocers. I took my permaculture design course (PDC) there in 2004. I highly recommend that anyone interested in learning some farming skills to get their PDC. Permaculture will teach you how to build soil and diversity using indigenous cultural practices. Perennial polycultures including fruits, nuts, and berries are combined with beneficial plants such as nitrogen fixers or nectaries using the model of a forest. You learn how to create a low maintenance edible landscape around your home. The local food scene is changing. Produce buyers are making an effort to buy local. CSAs like the Village Farm in Ashland, OR are using new models that lower annual member dues through work exchange, and at farmers markets you are starting to see more diverse products such as mushroom spawn and even worm culture. Land prices have come down significantly. Residential real estate prices are down between 20 and even 30 percent form their high in 2006. Last year was the first time since 1988 that farm values have dropped. 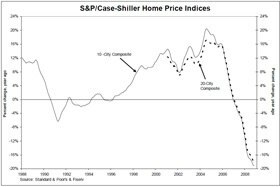 I still believe that real estate prices have another 20+ percent to drop until much of the land speculation inflation has been eliminated. Land values in suburban areas are still greater than their agricultural economic value. Today, you still cannot make enough money farming to pay the mortgage on suburban land, and as land values drop so does the purchasing power of the dollar. The point is that land is still expensive, so small diverse farms with “stacking functions” have the best chance for success. If you use the CSA model, you may have more leverage to buy land as a coop than as an individual farmer. The most famous example of buying land as a CSA was farmer John Peterson. The movie about his life The Real Dirt on Farmer John will turn every idea you ever had about what it means to be an American farmer, or an American dreamer, on its head. Cuba has already experienced petrocollapse when the Soviet Union collapsed in 1990. Today more than 50 percent of the vegetable needs of Havana’s 2.2 million people is supplied by local urban agriculture. In smaller cities and towns the rate is between 80 to 100 percent. Farmers are now among the highest paid workers. A new book called A Nation of Farmers: Defeating the Food Crisis on American Soil, is nothing short of a call to arms for local food proponents. Co-authors Aaron Newton and New York writer Sharon Astyk call for a grassroots-led agricultural revolution that would result in 100 million people becoming farmers and millions more becoming home cooks. It is important that this be a local grass roots movement, but it needs to be more. Local and state governments need to shift their emphasis away from the now defunct model of endless suburban sprawl and large agribusiness. Pouring more stimulus money down the drain after the single largest waste of resources in the history of the planet, as James Howard Kunstler has termed suburbia, is foolish. President Obama would probably make significant progress in his effort to reverse the recession by creating millions of new jobs right at home on small farms. The hundreds of millions of dollars spent by the USDA every year benefitting agribusiness should be redirected to family farms and CSAs. Agricultural state Universities and extension agencies need to shift their mind-set away from large to small farm economics. Extension agency offices should have staff dedicated to permaculture. Farm extension offices should be opened in cities to promote urban agriculture, and local zoning and land use codes modified to encourage urban farming. Organizations like the Detroit’s Garden Resource Program Collaborative need more funding. Detroit could become the Midwestern Havana. As long as private property rights trump community interest, they will get in the way of community benefit. If anyone wants to farm, they should be given tools, seeds, and a plot of land with water in usufruct. Vacant lots should revert to the community. The highest and best use for vacant urban land should be to give healthy food and secure jobs to those who most need it. An interesting revelation coming out of the recession is that unemployment is lowest in the Midwestern farm belt but highest in the California central valley. Every state in the country, with the exception of a band stretching from the Dakotas down to Texas, is now shedding jobs at a rapid pace. The highest rate in the country is in El Centro, CA due east of San Diego in the desert of California’s Inland Valley, experiencing a depression of 22.6 percent unemployment. I am trying to draw a conclusion from these interesting statistics. The California central valley has been hit especially hard by the drought. For the first time in 15 years, the U.S. Bureau of Reclamation officials said parched reservoirs and patchy rainfall this year were forcing them to completely stop surface water deliveries for at least a three-week period beginning March 1. The drought will cause an estimated $1.15 billion dollar loss in agriculture-related wages and eliminate as many as 40,000 jobs in farm-related industries in the San Joaquin Valley alone this year, where most of the nation's produce and nut crops are grown. The conclusion to draw is that we must start growing more of our food locally whether for peak oil or for global warming caused drought. We are seeing the end of 3,000-mile fast food. Whenever I talk about food, I have to remind people that humanity has been running a food race ever since the start of the agricultural revolution 10,000 years ago. Whenever we produce more food, we are producing more people. Which brings me to the reminder that no matter what your cause, it is a lost cause unless population is reduced. The first pillar to local food security is fewer people, then protect your agricultural land and grow your food locally. I have written extensively in this column and in Culturequake: The Fall of Modern Culture and the Rise of Earth Culture about overpopulation, so I will not belabor the point, but is bears remembering. Our culture has to reverse overshoot if we are ever going to have real local food security. This ties into my previous essay about the Free Nature Movement to start giving back what we have taken from the other species by reducing our population and consumption. We won’t have to turn rainforest into soybean and grazing fields if the demand is not there. Give a fair part of the Midwest back to the buffalo. I want to inspire new farmers. Even those who have never even been on a farm before or never gardened. Start thinking about it. Go to your local farmers market and talk to the growers. Visit their farms; ask questions. Volunteer for a work party. Tell your kids they can keep what they get for selling food to the neighbors. If you feel inclined, get involved in local politics to make some of the changes you want to see happen. Watch the new Permaculture for Beginners DVD when it becomes available later this year. In the meantime, read Gaia's Garden: A Guide to Home-Scale Permaculture by Toby Hemenway. Plant a fruit or nut tree and some berries in your backyard. Read seed catalogs. You would be surprised how many people are starting to think about growing some of their own food this spring. It can be as easy as planting green side up [as opposed to roots up!]. Good growing—here comes the sun.